When his death on March 27 at the age of 86 was announced, Royal Shakespeare Company artistic director Gregory Doran described Jeffery Dench as “the kind of actor that made the RSC what it is: he did not necessarily always play the leading roles, but proved by his presence that the company’s vitality lies in its strength in depth”. Dench had been a stalwart of the company for five decades, having made his first appearance in Peter Hall’s Wars of the Roses in 1964, his last in Paul Englishby and Ranjit Bolt’s musical version of The Merry Wives of Windsor, directed by Doran in 2006. Born the son of a doctor in Tyldesley, Manchester, the family moved to York, where, in 1934, his sister Judi was born. According to family legend, he persuaded her to become an actor. The pair appeared on stage together with the RSC, but her success would overshadow his, something that only occasionally rankled with him. Dench began his stage career at school and during national service was an assistant manager of the military-run Cary Theatre in Catterick. On graduating from the Central School of Speech and Drama, where he met his first wife, he won a scholarship to continue his studies at the University of Georgia in the US. Returning to the UK, he found work with regional repertory companies, spending much of the 1950s in York. His television debut followed in 1955 as Launcelot Gobbo in The Merchant of Venice for BBC Sunday Night Theatre. The small screen featured little in the years ahead, although in later life he appeared in episodes of Rumpole of the Bailey and The Brittas Empire. Dench joined Dundee Rep in 1959 before moving to the Marlowe Theatre company in Canterbury, where he played in A Man for All Seasons and the title role in Anouilh’s Becket (both 1962). The previous year, he appeared in the UK premiere of the same playwright’s The Rehearsal at the Bristol Old Vic, in a cast that included Maggie Smith and Robert Hardy. 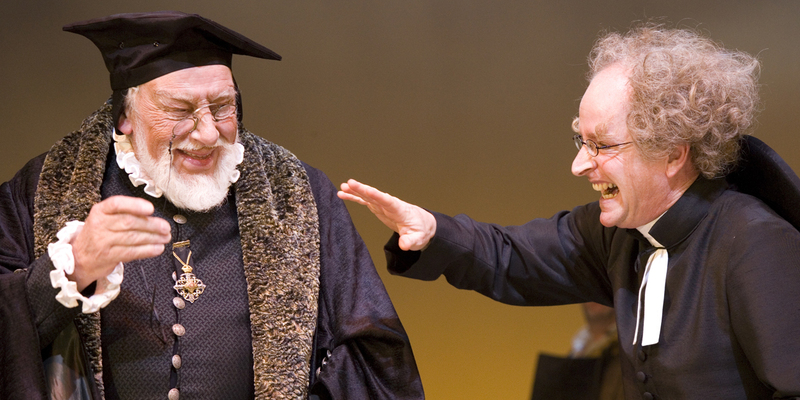 His early tears with the RSC saw him taking small roles alongside David Warner’s Hamlet and Paul Scofield’s Timon of Athens (both 1965), Ian Richardson’s Coriolanus and Scofield’s Macbeth (both 1967) and opening Trevor Nunn’s first season as Peter Hall’s successor with Arthur Kopit’s Indians (1968). Dench made his mark in that inaugural year and rose through the company to later recognition as an associate artist. Among his performances that grabbed attention were: as Master Page in The Merry Wives of Windsor (1968) directed by Buzz Goodbody, for whom he was also a memorable Gloucester in King Lear (1974); Sir Andrew Aguecheek in John Barton’s famous 1969 Twelfth Night (with sister Judi as Viola); a 1970 revival of Boucicault’s London Assurance; and, demonstrating a comic ability far removed from Shakespeare, as Ratty in Toad of Toad Hall (1972). Other non-Shakespearean roles with the RSC included the British premiere of Wedekind’s The Marquis of Keith (1974), Bronson Howard’s Saratoga (1978), David Edgar’s adaptation of The Life and Adventures of Nicholas Nickleby (1980, also transferring to New York and broadcast on Channel 4), and the Troll King opposite Derek Jacobi’s Peer Gynt in David Rudkin’s translation of Ibsen (1982). Away from the RSC, he appeared at the Young Vic in What a Way to Run a Revolution by David Benedictus (1986), JB Priestley’s Eden End and Terry Johnson’s Insignificance at the Thorndike Theatre, Leatherhead (both 1986) and Arthur Miller’s The Crucible (Belgrade Theatre, Coventry, 1988). He was equally at home in musicals, appearing in revivals of Kiss Me Kate (directed by Adrian Noble for the Old Vic, 1987), Bernard Miles’ Lock Up Your Daughters (Belgrade Theatre Coventry, 1988) and The Case of the Dead Flamingo Dancer (Thorndike, 1991). Returning to the RSC, he was seen in The Changeling (1993), The Winter’s Tale (1993) and Howard Brenton’s two-part adaptation of Faust (1994). His more recent stage appearances included: Troilus and Cressida and Gentlemen Prefer Blondes for the Open Air Theatre, Regent’s Park (1998); Macbeth (Theatr Clwyd, Mold, 1999); Twelfth Night and Pericles for the Ludlow Festival in 2000; an adaptation of The Railway Children (New Vic Theatre, Newcastle-under-Lyme); and Ayckbourn’s Bedroom Farce (Theatr Clwyd, Mold), both in 2001. Jeffery Dench, born on April 29, 1928. died on March 27. Following the death of his wife in 2002, he married Ann Curtis, a costume designer with the RSC, who survives him along with his three daughters from his first marriage.